'Planet Bonanza' Indeed: NASA Unveils 715 New Worlds : The Two-Way The space agency announces a stunning discovery, as the Kepler mission identifies 715 new planets that orbit 305 stars. The finding boosts the verified number of such planets by around 70 percent. This artist rendering provided by NASA, shows Kepler-11, a sunlike star around which six planets orbit. The job of NASA's Kepler mission is to peek at the far reaches of space in the hopes of finding potentially habitable planets. 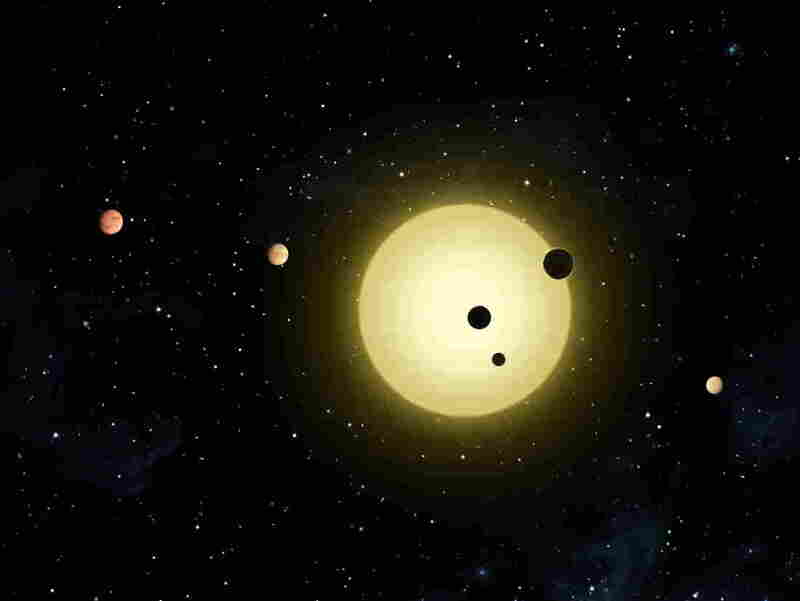 The space agency announced a stunning success, saying that Kepler had identified 715 new planets that orbit 305 stars. The discovery boosts the number of verified planets by around 70 percent. "Four of the planets are about twice the size of Earth and orbit in their star's so-called habitable zone," NPR's Nell Greenfieldboyce reports for our Newscast unit, "where temperatures might be suitable for liquid water." The new discoveries are in multiple-planet systems like our solar system, NASA says. 94 percent of the planets are smaller than Neptune (which is nearly 4 times Earth's size). The planets and stars were analyzed by researchers using data from the first two years of Kepler's observations — May 2009 to March 2011. The count of verified "exoplanets" (those outside our solar system) now stands at nearly 1,700. "From this study we learn planets in these multisystems are small and their orbits are flat and circular — resembling pancakes — not your classical view of an atom," says Jason Rowe, a leader of the research team and a scientist at the SETI Institute in Mountain View, Calif. "The more we explore the more we find familiar traces of ourselves amongst the stars that remind us of home." NASA also stressed Wednesday that the planets it is discussing are different from the "planet candidates" that previous studies have uncovered. "Four years ago, Kepler began a string of announcements of first hundreds, then thousands, of planet candidates — but they were only candidate worlds," said Jack Lissauer, planetary scientist at NASA's Ames Research Center in Moffett Field, Calif. "We've now developed a process to verify multiple planet candidates in bulk to deliver planets wholesale, and have used it to unveil a veritable bonanza of new worlds." "The research team used a technique called verification by multiplicity, which relies in part on the logic of probability. Kepler observes 150,000 stars, and has found a few thousand of those to have planet candidates. If the candidates were randomly distributed among Kepler's stars, only a handful would have more than one planet candidate. However, Kepler observed hundreds of stars that have multiple planet candidates. Through a careful study of this sample, these 715 new planets were verified." But if we've found out the address of a new neighbor, it could be a while before anyone can pay a visit. "The light we're seeing was emitted from these stars 1,000 years ago," NASA tweeted during today's announcement. You can see a list of the "confirmed planets" at the Kepler mission site. The agency highlighted one planet called Kepler-296f that is in a habitable zone and orbits a star half the size and 5 percent as bright as the sun. "Kepler-296f is twice the size of Earth, but scientists do not know whether the planet is a gaseous world, with a thick hydrogen-helium envelope," NASA says in a news release, "or [if] it is a water world surrounded by a deep ocean." A NASA graphic shows the number of known exoplanets by size. 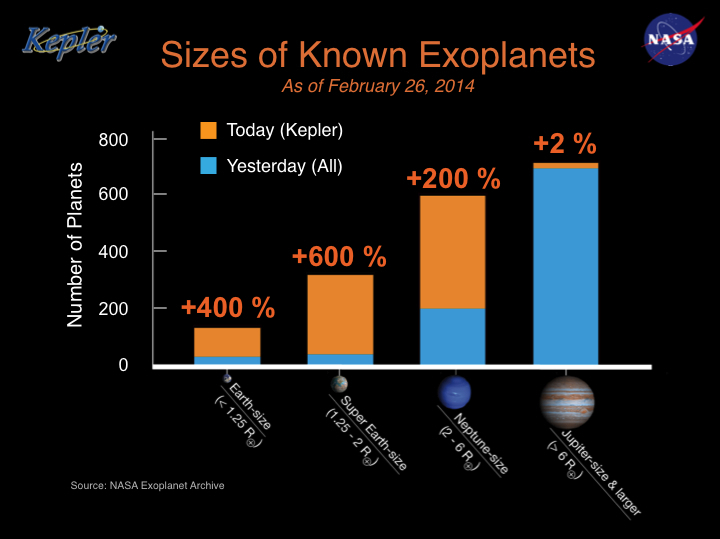 The blue bars represents all the known exoplanets by size before Wednesday's "Kepler Planet Bonanza" announcement.